China is a polarizing country. Travelers either absolutely love or completely loathe it. Why? It's culturally about as different as you can get to a typical Westerner's background. China isn't light touring, it's real traveling. Those who want an easy travel experience tend to have a tough time in China, but those who embrace cultural differences and adventure will come to love it and find it's a country where they can have a truly unique and real travel experience. I am of the latter camp and absolutely love China. China is one of the biggest and most populous countries on the planet. It can take a full month just to barely get through one province. Whether you're interested in the dazzling lights of Beijing or Shanghai, prefer the snowy beauty of the Himalayas closer to Tibet, or the vast distances in-between, China has something to offer you. Transportation works well, and price-wise, China falls in the middle as far as expenses. Food and lodging can be quite cheap and the hostels are some of the best in the world for value. For outdoorsy types, there are plenty of mountains to climb and China is also a photographer's dream. It can be bewildering, horribly polluted in places, and is guaranteed to present challenge after challenge, but give China a chance to get under your skin, and you may never let it go. I know that I can't. 'Hello' and 'Thank You' in Mandarin: "Ni Hao" and "Xie Xie"
Visa: Must obtain prior. Amount of days heavily depends on where you obtain it. Best method is at home from your home country. Safety rating: Ranked 116 on the Global Peace Index with a score of 2.24 (USA is ranked 114 with a score of 2.23) - this is mainly due to political terror and heavy weapon numbers. Tourists, however, are rarely victims of violent crime. Solo Travel Friendliness: I had a first-hand experience with Chinese hospitality when hitchhiking in China back in 2014. People were friendly and generous, and I never once felt threatened or endangered. Because traveling solo as a female is not a norm in most parts of the country, you might get questions from the locals and in some situations, it will make things easier to say that you are meeting a friend soon. Modesty Considerations: Major cities are incredibly modern and trendy and there’s no specific dress codes, though you may be required to cover your shoulder and knees when visiting the temples. In the rural areas, people are more conservative and it is polite to dress modestly. Random useful tip: Learn some Chinese. China is one of the countries where English will not be spoken much, if at all, and a few words go a very long way! 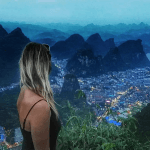 Budget Solo Travelers ($5 - $10): Hostels in China might offer the best value in the world - they’re usually pretty nice! Dorms and youth hostels are common in most cities and in small villages, with new places often drastically better than the old ones in terms of quality and service. Expect to pay about $5 for a basic dorm room with fan, and more in bigger cities for the same room type. If you choose to walk in instead of booking ahead, make sure to ask to see the room first, and negotiate –. Expect to pay 30% less than the advertised price during low season. Couchsurfing is also increasingly popular in major cities. Mid Budget Solo Travelers ($10 - $30): The same theory applies to budget and mid-range hotels – new places are generally much better than the older ones. There are single, double, triple and even quadruple rooms to choose from. Most private rooms come with free breakfast. Take note that the use of different Chinese words for the hotel is an indication of quality and price range, with Da Jiu Dian is on the higher end of the spectrum, and Zhu Su is on the cheaper end. Airbnbs average at about $25 for a private room, and at about $55 for an entire unit. Getting There: Most major cities have their respective international airports, while the most major ones include Beijing Capital International Airport, Guangzhou Baiyan International Airport, and Shanghai Pudong International Airport. Direct flights are available from most parts of the world. Crossing borders overland is possible from Russia, Mongolia, Pakistan, Nepal, Vietnam, Laos, Myanmar, and the Central Asian Republics. If you’d like, you can also take a ferry from Korea and Japan to China. Getting Around Town: The Chinese government invests heavily in transportation and infrastructure, making getting around a breeze – as long as you can recognize the destinations in Chinese writing. Trains are efficient and punctual, with a single trip costing as low as $0.20; buses, on the other hand, while frequent and cover routes wider than trains, often do not always have fixed schedules, so allow time to get the bus station and buy your ticket rather than waiting until the last minute.. DiDi is China’s version of Uber and it is available in all cities. Inter-city Travel: Inter-city trains are efficient and fast – high speed trains reach 210 miles per hour. The cabins are spotlessly clean and comfortable but much more expensive than normal trains. Expect to dish out more than $100 for a ticket from Shanghai to Beijing. Trains of other classes are less comfortable but much cheaper, and all trains offer food for purchase onboard. Buses depart frequently and cover routes wider than trains. Flying from one city to another is easy, and sometimes cost less than trains. Hitchhiking in China, based on my personal experience, is surprisingly easy and you are bound to meet friendly and generous locals who are more than willing to help and expect nothing in return. It does help, however, if you have a Mandarin speaker with you. Local Food Spots ($1 - $5): The food in China is cheap and delicious. A big bowl of noodle soup usually costs less than $1! Food stalls on the roadside, markets, and hole-in-the-wall style restaurants with plastic tables and chairs are where you can sample true Chinese cuisine at a low price. However, hygiene and food safety are often questionable , so pick places that are crowded with locals and when possible, take a quick glance at the kitchen. Restaurants ($5 and up): Most Chinese restaurants tend to be set up for groups, with large round tables and mostly a la carte items on the menu. A restaurant dining experience is best shared with friends made at the hostel, as you get to sample different dishes and share the bill. Most dishes are freshly prepared, especially seafood – some restaurants have aquariums keeping the fishes, crabs, lobsters, and prawns fresh and, well, alive until the last minute. Prices vary depending on your order. A simple vegetarian stir fry could cost less than $3, whereas exotic seafood could cost hundreds. Tipping is not expected in most restaurants. Western restaurants are on the rise though the food is usually disappointing, so it’s best to stick to trying out Chinese cuisine. Jiuzhaigou and Beyond: Neighboring Tibet, Jiuzhaigou is instantly recognizable by its colorful lakes with crystal clear water reflecting their surrounding mountains, and vast array of multicolored prayer flags that have been strewn across the hillsides. It is often packed with tourists, locals and foreigners alike. If you want to look for something off the beaten path, there is Huanglong National Park, a hidden gem of the province that is only a 40-minute drive away from Jiuzhaigou. Trek in Sichuan: This province is full of amazing treks. One of the must-sees is Siguniang Shan (Four Sisters Mountain) East of Chengdu in Sichuan province’s Tibetan Autonomous Prefecture. It’s a trek that most foreigners aren’t aware of and haven’t had the opportunity to see. Another trek worth checking out is Mount Emei, a UNESCO World Heritage Site. Due to its significance and popularity, the Emei shan hike has been paved with stairs and offers gondolas up and down as well. Explore Modern Shanghai: This is what the future looks like! This cosmopolitan city is packed with the latest technology, neon lights, and billboards. The top of China’s tallest building, Shanghai Tower (119 floors! ), is the perfect spot to get a panorama view of the city. The Great Wall of China: The 2,300 year old wall that was built to fend off invasions is now the most iconic place in China. Expect the place to be packed with tourists no matter the time of the year. Tiananmen Square: Located right in the center of Beijing, Tiananmen Square is one of the biggest city squares in the world. If you are interested, you can see Mao Zedong’s embalmed body in the mausoleum between 8am – 12pm. There are also museums, viewing halls, and Communist architecture that could easily take an entire day to go through. WeChat (essentially China’s version of Facebook, you can even order food, make reservations, and send money through the app), DiDi (China’s version of Uber), ExpressVPN (to access websites that are blocked in China).